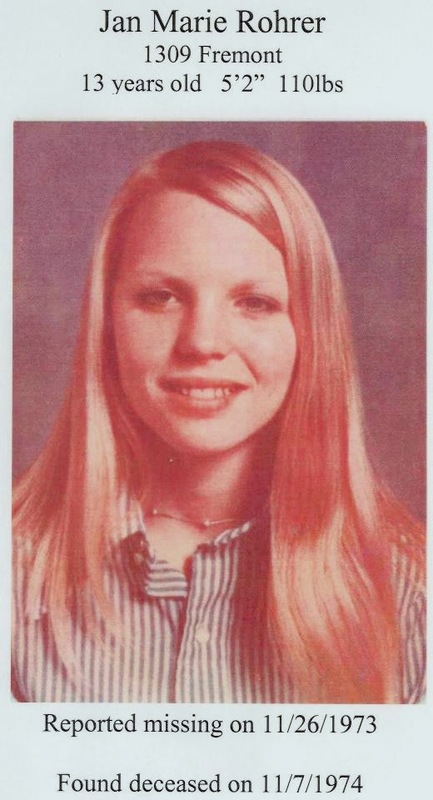 In 1973 Janet Rohrer disappeared on the way to school. Her body would be discovered one year later. Was her death the work of a serial killer? Could she be linked to the Oakland County Child Killer? While we are focusing on Janet Rohrer, this episode covers four unsolved murders in Bay County between 1972-1973. At the end of the episode, you expressed your reluctance to write about the 1976-1977 Oakland County Child Killer, and while I understand your reluctance, I do wish that a writer–a serious journalist–would devote time to putting together an in-depth look at that case. For whatever reason, those murders gained very little national attention until about ten years or so ago; from what I’ve been able to learn about the case since then (I was eight years old in March of 1977, and recall quite vividly the week Timothy King was missing) much of what I “thought I knew” about the murders and their investigation was wrong. I mention this to you, Nina, because I sense that you truly sweat the details with each of these stories you present, acknowledging and presenting rumors, myths or unproven facts as exactly that; and although you often present theories you have formed, you never let your theory drive the narrative. I also mention this because I really wish that a writer with the skills and the resources to do so would take the opportunity to write the definitive book on the Oakland County Child Killer. Investigaors, family members, suspects, victims and witnesses are all growing older, and I hate the thought of important information not coming to light because the right person was never asked the right question. Obviously, I really don’t think I can necessarily convince you to change your mind about not covering the Oakland County Child Killer with a single blog comment. (That’s not how I operate, and I understand your reluctance to delve into these crimes–I have spent way too many idle hours unable to stop thinking about the horrors that those kids went through while in captivity.) But I do honestly wish that those murders could merit some serious, rather than ghoulish attention, because as you mentioned, it is almost certain that more than one person (at least!) must have been involved in those crimes, and I have a hunch that somewhere out there, right now, today, somebody knows something about these murders. Jan was my dad’s cousin. Thank you for keeping her memory alive and for the respectfulness of your story. I appreciate the comment Amy. Infuriating that they’ve waited so long for justice. I’m excited about the arrest and I hope they can come up with enough to hold him and build a case!